Before leaving Ybbs, we went to the church to see if we could find the carved tomb of Hans, Knight of Ybbs, from 1358, as described by PLF (A time of gifts, 1977, p.159 Penguin edition), and there it was! Gilt and cherubs were there in good quantity too. Onwards to Pochlarn beside the wide Donau, then the abbey of Melk could be seen high in the distance. Melk is Tourism Central with bus parking, tour groups and souvenir shops. The bicycle parking area had luggage lockers so bicycle tourists are well catered for. We mainly osmosed the history here – it was either that or join a tour or do a degree in European history. After leaving Melk, it was hard to make progress as we needed to stop many times to eat fruit, rest, see things, find shade (it was quite hot and humid). We chose the worst cafe where, despite being open for business, they didn’t want to serve any food. We had a toasted sandwich no better than you can get in a Tailem Bend roadhouse. 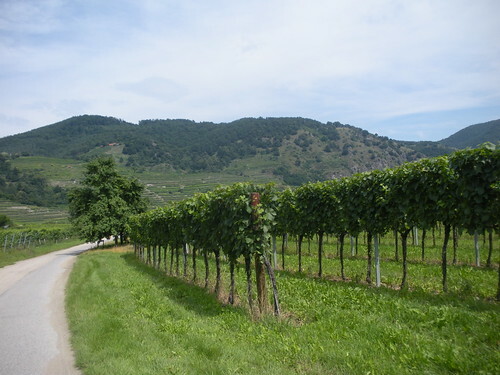 This tragedy aside, the Wachau was beautiful with orchards, terraced vineyards, river enclosed between hills on either side, villages with narrow streets, views, lots of bike riders and cruise boats on the water. After Krems the river valley broadens and becomes more industrial with factories and power stations. We had a headwind too. Now we are at Langenlebarn, just past Tulln, for the night and will go to Vienna in the morning. Hi Ros, didn’t get to see hundertwasser but would have loved it. Now in B’pest feeling a bit overwhelmed. Too much to take in. But getting the hang of E Europe. Thanks Richard – uke has been asleep for awhile but is coming out for a rendition of the third man theme as we are in Vienna. Also you’ll be glad to know it appears to be waterproof!